…A LOT FOR LITTLE MONEY! A beautiful house from the turn of the century, right in the railway station district of Frankfurt. „All you can eat“ breakfast, as well as certainly bedlinen are always included in the price. Rooms are equipped with private shower and toilet. Internet-corner, bar, luggage-room, elevator and much more besides are at your disposal the whole year. 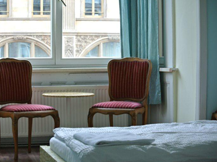 …OUR ROOMS IN THE HOSTEL! If you want peace and relaxation, we can offer you a single or double room. With your friends, colleagues or your family we can offer you a shared room for up to six people. Would you be happy with other people together, it is a dorm bed in the right place to stay. For women, we have separate dorms for more privacy.